Some good quality test equipment has been retained from my old business and more purchased on eBay at a tiny fraction of the original price. I could not afford to buy Hewlett Packard kit when I was in business! Various bits and pieces of electronics equipment seem to come my way from friends and occasionally even from rubbish skips! These are either used for my projects, scrapped for spare parts (to save on buying components), or refurbished for sale; to generate some positive cashflow! For me it is very important that the equipment is maintainable, with good Manuals for operation, calibration and service. 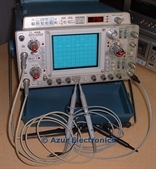 HP and Tektronix are particularly suitable for this with some excellent downloadable manuals, plus there are forums at Yahoo Groups which provide lots of assistance. Most modern equipment does not provide full service information, so without circuit diagrams and parts lists repairing any faults is not really feasible. Another issue is that I prefer displays to be red or green LEDs, rather than LCDs, this makes the display more readable in low ambient light levels.